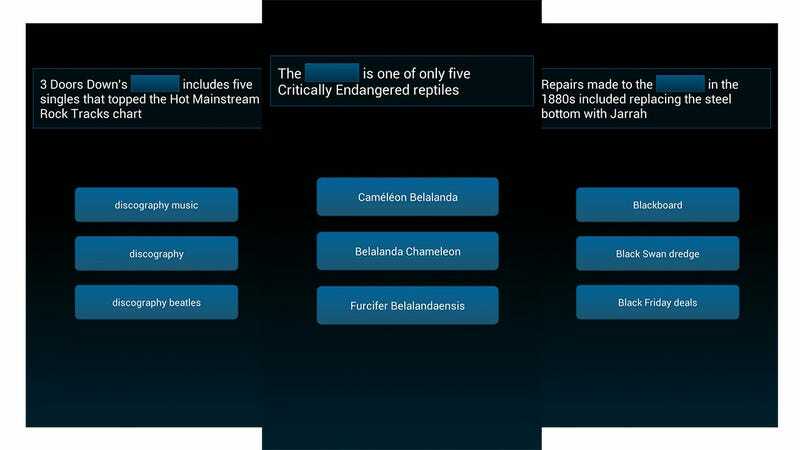 Available free today on Google Play, Wiki Quiz (as seen on SlideDB) is as simple little Android app that randomly generates multiple choice questions from the digital repository of the world's accumulated knowledge, expurgated edition. The questions and answers are all pulled from Wikipedia, and most of the time the correct answer is fairly obvious. What's nifty is that after you answer, you're given the option to learn more via a button that opens the corresponding Wikipedia page in your mobile browser. As a game it's fairly simple, but as a discovery tool it's quite lovely. You can grab Rockbyte's Wiki Quiz here.